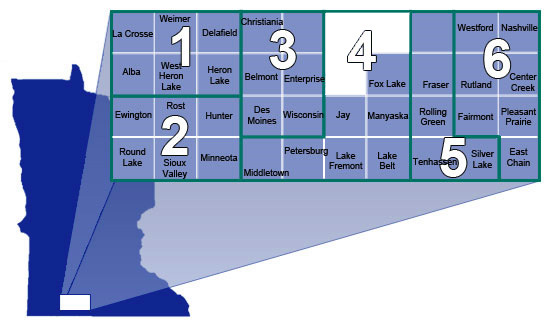 Federated Rural Electric is a distribution electric utility serving member-owners in Jackson and Martin Counties with some along the bordering counties and in Huntington, Iowa. Federated is headquartered in Jackson with a warehouse in Welcome. As a cooperative, we are owned by the members we serve and are governed by a seven-member Board of Directors who are elected by the membership at the Annual Meeting. Directors are elected according to the districts shown and an At-Large District. Federated receives wholesale power from: Great River Energy, Western Area Power Administration, L&O/Basin Electric Power Cooperative and Alliant Energy. We belong to the nationwide network of cooperatives known as Touchstone Energy Partners.